Summer is here! Now the solstice has made it official, but we’ve enjoyed (or suffered through) a hot spring masquerading as summer for the past few weeks, giving us plenty of opportunities to polish up our coping skills for the next few months. 1. 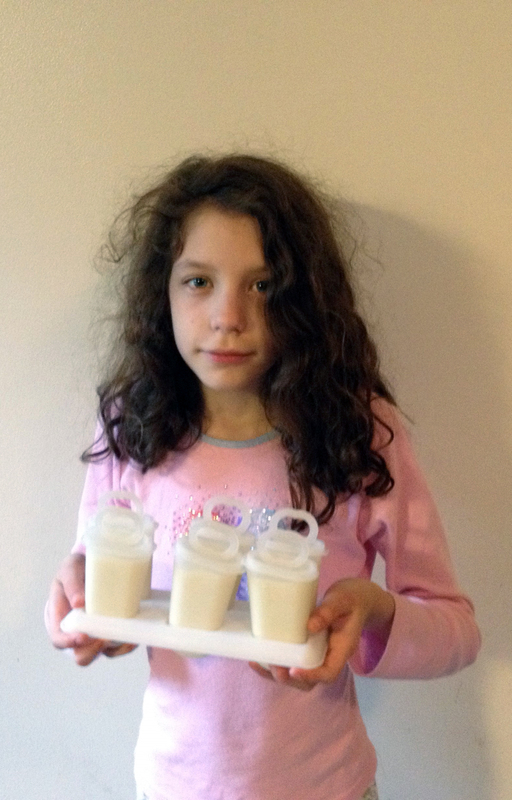 POPSICLES AND SMOOTHIES—cold treats are such a classic indulgence for kids, combining yumminess with refreshing coolness. I make our popsicles, usually from leftover smoothies; we drink a smoothie almost every morning (unless the blender is otherwise occupied by coffee, in which case we have smoothie for lunch). It’s pretty simple: I dump yogurt or kefir into the blender, add bananas and berries—sometimes honey if the kefir is particularly tart—and voila: a sweet, nourishing, and delicious drink. 2. ICED COFFEE/ICED TEA—this one’s a cold treat for the adults! We don’t drink coffee regularly, because I’m afraid of creating a caffeine addiction. Instead, we have it 2-3 times a week, just enough to indulge occasionally without getting hooked. In the summer, I’ll make a big batch of coffee one day, drink some hot that day, and pour the extra into ice cube trays for the freezer and jars for the fridge. Then later in the week I’ll pop the ice cubes into the blender with the cold coffee, add in honey and fresh milk or cream, and blend it up to a slushy consistency. Delish! And while I savor hot tea during the winter months, in the summer I revert to iced tea. I’ll brew a batch of herbal tea by the gallon, mix in a little honey, and store it in the fridge for easy sipping. It can be easy to get dehydrated, so I try to keep plenty of good beverages on hand to encourage drinking. 3. 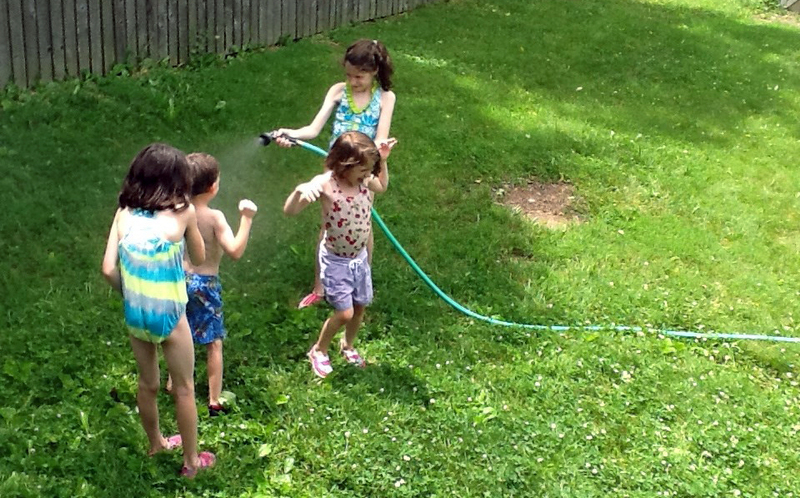 SPRINKLERS—running through the sprinkler is such a classic summertime activity. 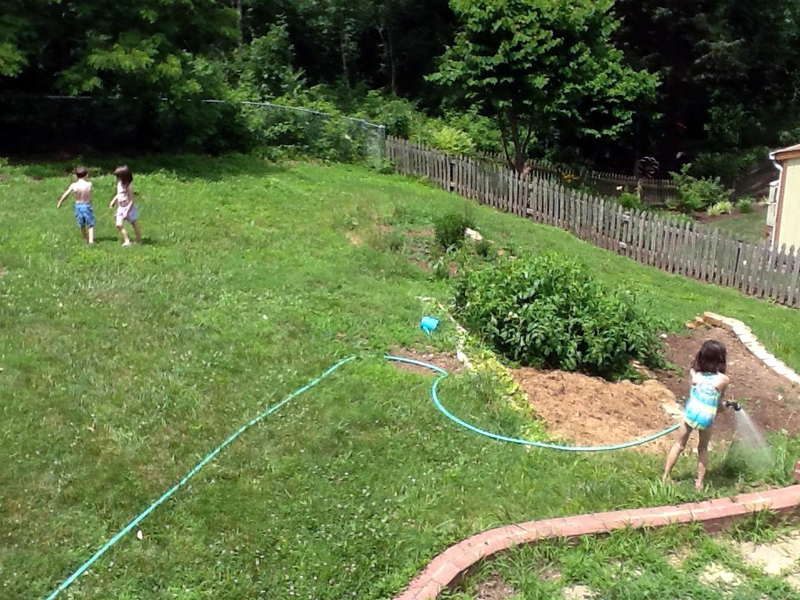 Instead of using a sprinkler, though, we combine work with pleasure by watering the garden while having cool fun. I send the kids out in swimsuits and instruct the older ones to water the plants. Then we switch the nozzle to mist, and the children take turns holding the hose and spraying each other. The mist function not only slows the water flow and reduces waste, but also ensures that no one will get pummeled by a blast of water. 4. AIR CONDITIONING—we tend to keep the house at a moderate 78-82 during the summer. This saves on electricity, of course, but it also helps build gratitude by not acclimating us to our preferred comfort zone. When it’s in the high 80s or 90s outdoors, even the high 70s feels like a welcome relief by comparison. I frequently remind my kids how fortunate we are to live in a time and a place where we have the ability to cool our air – not even King Tut or Croesus lived in such comfort. 5. 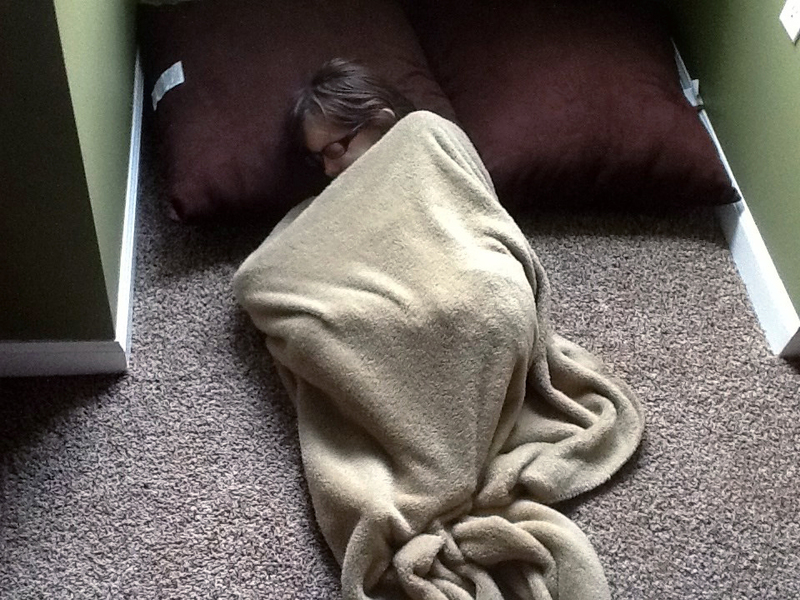 SIESTA—as my children reach a certain age, they do outgrow the nap time. Having the older ones rest or read quietly during the nap time is a logistical necessity to ensure that the younger ones can sleep. However, it has the added benefit of keeping everyone peaceful and calm, and it inhibits wild, energetic, sweaty play during the hottest part of the day. Sometimes the older ones surprise themselves by actually falling asleep. We love summer. 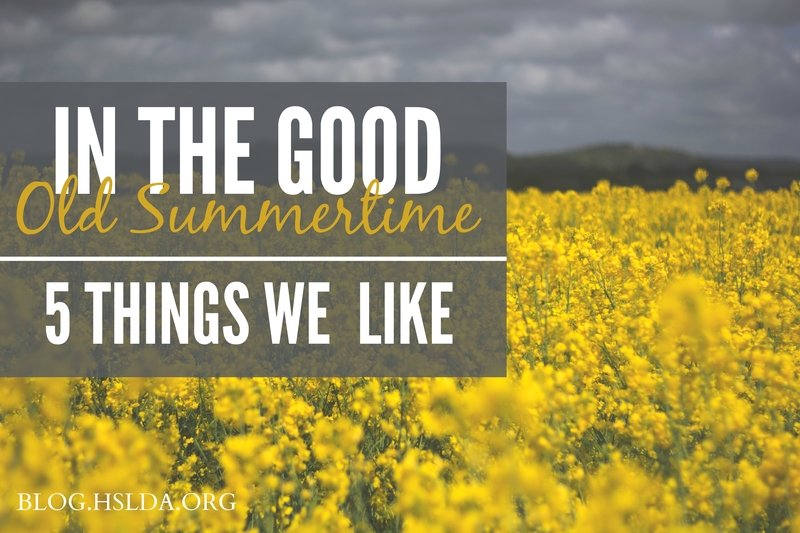 From its slower pace to its warmer temperatures, it is altogether a wonderful time of the year. Or so we tend to think in the middle of a dead and bleak winter; when the actual summer hits, we groan and slowly wilt from the intense heat. The visions of healthy children with ruddy countenances happily playing outdoors from dawn until dusk melt into the reality of hot, stinky kids with dirty feet trooping indoors despite repeated attempts to send them out, letting flies and mosquitoes inside with each retreat. But we do our best to keep things fun and upbeat. Photo Credit: First photo graphic design by Charity Klicka; all other photos by Rose Focht, edited by Charity Klicka.